Nursery is a time of exploration and discovery. Young children become engaged in learning experiences when given materials that are hands-on. This gives them a wide and varied number of ways to learn about the world and develop socially, emotionally, physically and cognitively. Our staff recognize that each child has a unique set of abilities and needs and learns at their own pace. At Camden Community Nurseries we recognise parents/carers as their child's first educators and aim to work in close partnership. Children learn at different rates and all areas of learning are important and interconnected. All three nurseries are open from 8am to 6pm, 50 weeks of the year. 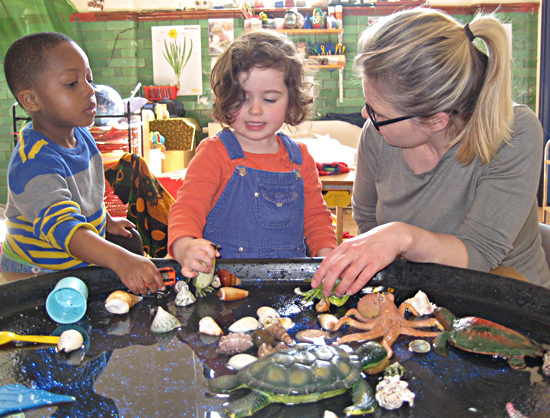 Our nurseries are committed to the inclusion of all children. All children with special needs have a right to a broad and well-balanced education. We work alongside parents to enable us to help their child to develop to their full potential. Our nurseries are dedicated to work with any child who has a specific need or disability to enable the child to make full use of the nursery's facilities. We believe that all children have a right to experience and develop alongside their peers no matter what their individual needs. Meals provided at each nursery are nutritious and well balanced, and are freshly prepared on the premises by our qualified cooks who have an understanding of nutrition, hygiene and planning a balanced menu. Our rotating menus consist of 3 meals a day: breakfast, lunch and tea. There is also a mid-morning snack times when fresh fruit, vegetables and water/milk are served. Babies start on formula milk, moving on to baby rice, rusks, pureed food and finally chunky food prepared from the older children's menu. We welcome breast-feeding mothers by providing storage for expressed milk. The largest and most recent addition to our nurseries, Acol has space for up to 50 children ranging from 3 months to 5 years. Acol is open from 8am till 6pm, 50 weeks of the year. Situated in a large town-house in West Hampstead, we have created a homely feel with a flexible range of rooms to support both free imaginative play and more structured activities tailored to each age group. Our large, secure outdoor play area promotes children's' physical development and offers a fun way to burn off some energy with friends. Our young, professional and energetic team creates a sense of belonging and all children feel included, secure and valued. Acol has a sensory room fosters an atmosphere of relaxation. Relaxation is good for children's emotional health; it gives them a chance to explore their feelings and to become interested in their environment. A facility such as this has many benefits for children with special needs as it creates a stimulating and yet calming atmosphere and among other things can help to improve hand and eye co-ordination and develop language skills. The overactive child can be calmed, the inactive become interested. For information about availability of places, contact Acol Nursery by phone on 020 7624 2937 or at the address above. Read Acol's latest Ofsted report and parent testimonials. Our nursery is situated in the heart of West Hampstead in a converted community hall with plenty of character for our children aged from 2 to 5 years. Sington is open from 8am till 6pm, 50 weeks of the year. Playing is a serious business at Sington. The team provides for a loving and creative atmosphere, where children learn through play, enjoy respect and autonomy and develop caring relationships with staff and friends. We have a long-standing team of nursery staff, which makes for a very stable environment for children - a real home away from home. Staff are imaginative in the array of activities laid out for children, from painting to cooking, to movement and dance, reading, rhymes, sand and water play and of course, all-important pottering around. We help children to reach those important nursery milestones: gaining confidence away from home, forging their first friendships, exploring their likes and dislikes, and later, preparing for the transition to school. With this in mind, we have set up a quiet side room where older children are given more focussed sessions on reading and writing. Children are taken out daily to local playgrounds or we use community rooms for movement and dance indoors. In summer, children head up to Fortune Green for sports day and nature walks. For information about availability of places, contact Sington Nursery by phone on 0207 431 1279 or at the address above. Read Sington's latest Ofsted report and parent testimonials. Montpelier operates in a beautiful eco-building, designed specifically for local children by former Montpelier parents. 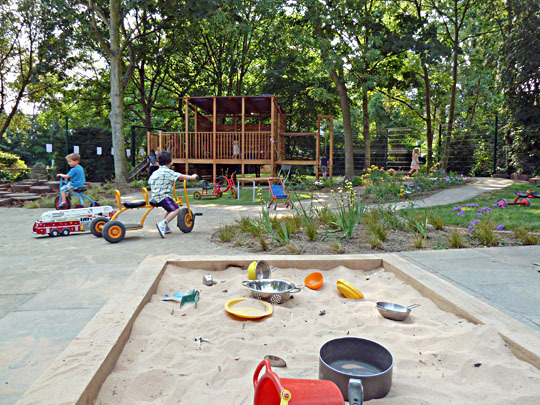 This award-winning building and its landscaped garden provide care for children aged 2 to 5. Montpelier is open from 8am till 6pm, 50 weeks of the year. Our children learn through outdoor activities and natural play. We have a substantial outdoor space surrounded by mature plants, shrubs and trees that can be used for growing plants, fruit and vegetables and exploring nature. We create a sense of belonging and all children feel included, secure and valued. Our indoor space promotes creative and imaginative play and is always supported by caring and trusted team making Montpelier a unique home-like environment. The children are given freshly cooked meals every day and eating together is an enjoyable social experience. We regularly invite other professionals to run special events at our nursery. For more information about availability of places, contact Montpelier Nursery by phone on 020 7485 9813 or at the address above. Read Montpelier's latest Ofsted report and parent testimonials.